Easter is just around the corner, and you know what that means—chocolate and more chocolate! We know chocolate is irresistible, but it’s also full of sugar and fats. 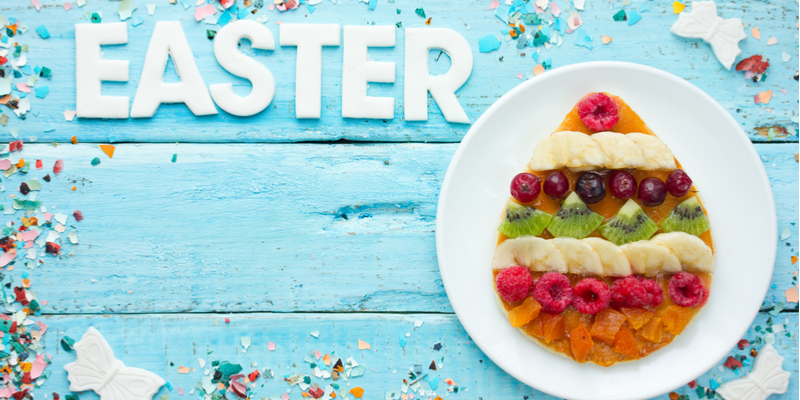 On top of that, there’s Hot Cross Buns, lollies, and other sweet treats that are popular at Easter, so it’s no surprise that it’s a hard time of year to stick to a healthy diet. But don’t fret; you can still have a healthy Easter. How? Read on. If you still want to indulge in some chocolate or other sweet this Easter, you can, but the key is to take small bites and eat slowly. If you try to avoid treats completely, it could come back to bite you. Denying yourself something makes it even more tempting, so allow yourself to enjoy those lovely Easter treats, but moderate the servings to avoid guilt and consuming excessive calories. Another trick is to buy small, individually-wrapped chocolate eggs. Whenever your sweet tooth kicks in, unwrap and eat one egg at a time. By spending time and effort to slowly unwrap each egg to satisfy your craving, you’ll be able to moderate and count the amount you eat. Not all chocolate is created equal. Take dark chocolate for example—it’s lower in sugar, it has more cocoa content, and it’s packed with antioxidants. Go for a high cocoa content for more antioxidant bang for your buck. Dark chocolate is richer in flavour and also a bit bitter, so you might also need less of it to satisfy your cravings. If you want to treat yourself during Easter (who doesn’t!) then it’s important to make sure your other meals are healthy. One way to do that is to start the day with a protein-packed, fibre-rich breakfast; for instance, go for vegetables, eggs (not the chocolate kind), whole grains, and fresh fruit. With that kind of breakfast, not only are you having a nutritious start to the day, but you will also be feeling fuller for longer and won’t need to reach for a sweet treat to stave off hunger. To control your sweet cravings further, regularly take small, healthy snacks, ideally every three or four hours. This will keep your stomach feeling full and will also help balance your blood glucose levels for the rest of the day. Some great snacks ideas are nuts, fruits, salads, yogurt, and vegetable soup. Also, don’t forget to drink lots of water. Not only can water help satiate hunger, it will also keep you hydrated and feeling your best. Celebrating Easter with family and friends doesn’t have to mean that healthy foods go out the window. If there’s a large gathering (like a barbeque party in the neighbourhood), you can offer to bring salads or fruits so there will be some healthy options on the table. Instead of buying high-calorie sweets from the store, prepare your own homemade treats so you know exactly what’s going in them. If you’re left with lots of chocolates this Easter (you could have bought too many or been given a lot), remember: you don’t have to finish them all. Share them with your family, relatives, and friends; we’re sure they wouldn’t mind helping you at all. You will be lightening your calorie intake and you are also avoiding having too much irresistible food in the house. Here’s a better option: prepare nutritious treats so everyone can indulge healthily. This way, you’re reducing not only yours but also your loved ones’ calorie intake, as you share the habit of healthy eating.